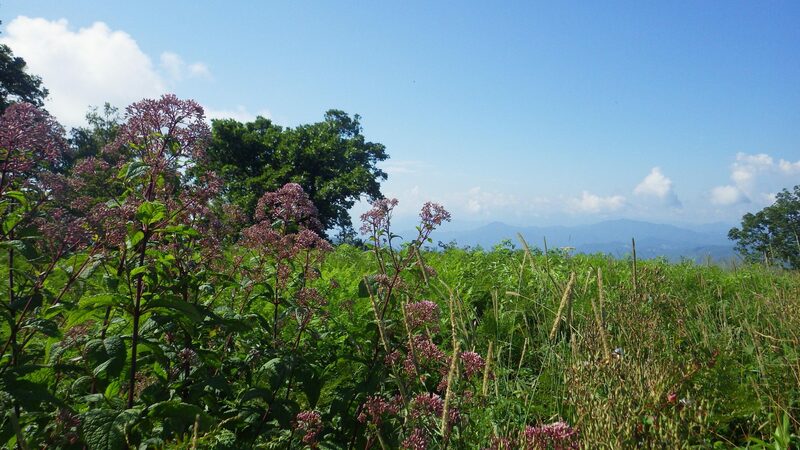 Beauty Spot Bald, a gap along the Appalachian Trail on the Tennessee/North Carolina border, has an abundance of views, pollinators and, on July 26, volunteers searching for the Rusty Patched Bumble Bee. With 11 volunteers plus three US Fish and Wildlife Biologists, Beauty Spot Bald was one of our most thorough searches this summer. Looking out along the grassy fields where our search began, it was easy to spot many species of butterfly floating over the flowers. 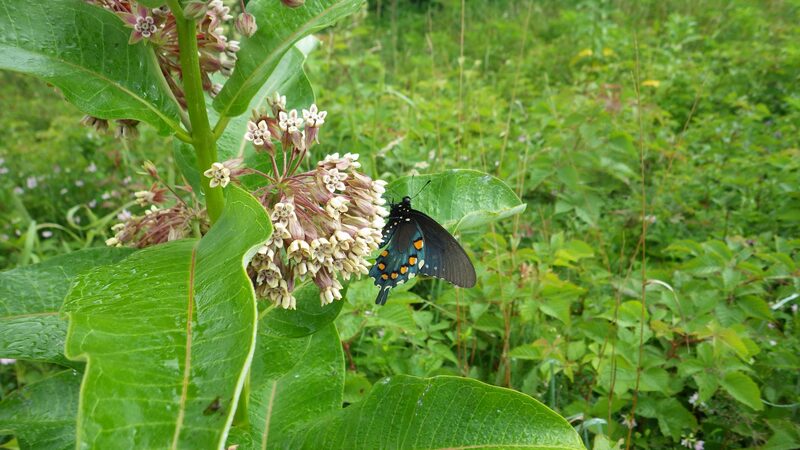 Often the wildflower species that attract butterflies, in this case Joe Pye Weed, milkweed and the invasive Bindweed, also serve to attract Bumble Bees. Getting closer, we could see this was definitely the case here. Throughout the morning, our volunteers rounded up as many of the abundant Bumble Bees as they could, stopping every so often to snack on the ripening Blue- and Blackberries along the way. While many of these Bumble Bees were all the same species, the Common Eastern, a few could not be identified in the field and may prove to be very interesting once experts help us figure them out. After about an hour of searching, the soft summer sounds of birds and breezes turned into something a little more mechanical. Mowers had arrived to clean up the trail. Initially, we thought nothing of it, after all, trail maintenance is an important step in making sure people can enjoy natural spaces in a safe way that also protects the land. It became obvious, however, that the mowers were not going to stop with the trail and were in fact clearing the same habitat we were searching. 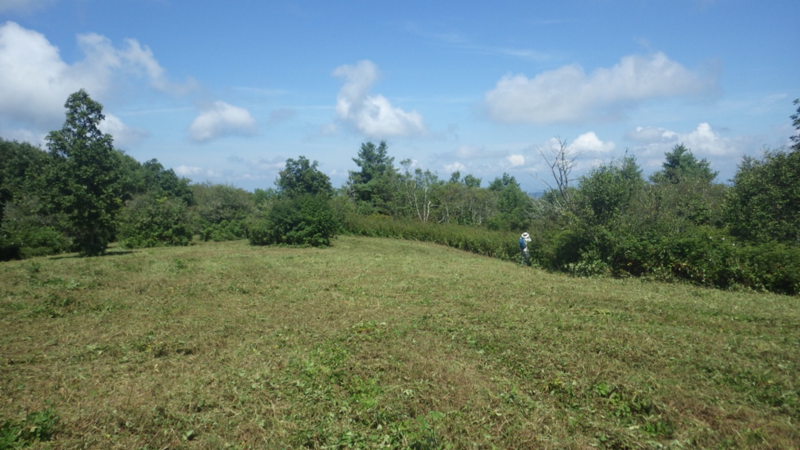 Some in our group approached the maintenance crew and learned that they were clearing sections of the grassy bald to prevent saplings and woody bushes from taking over the wildflowers and grasses. This brings up an interesting conversation brewing in our region. What is the best way to maintain Appalachian Mountain Balds? 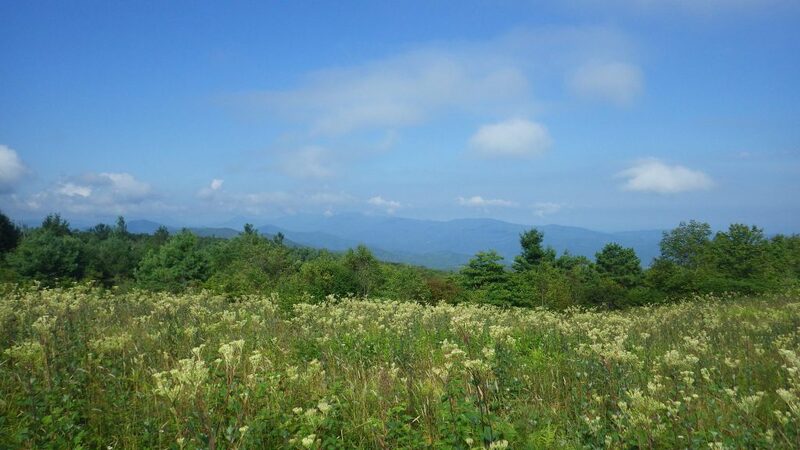 These “mountain top meadows” are a unique feature of the Southern Appalachians, mountaintops that are warm enough for trees to cover and yet have existed as grassy balds for potentially thousands of years. On the other hand, some of the balds were created only in the last hundred years as logging opened up previously forested areas. This variety of creation has led to a variety of maintenance techniques, from the grazing ponies of Grayson Highlands State Park in Virginia and a decade of roaming goats in Roan Mountain, Tennessee to the tractors and bush hogs we saw firsthand in Beauty Spot. It was, and remains, impossible to not feel some degree of anger watching pollinator habitat being destroyed after having seen up close how active it was. 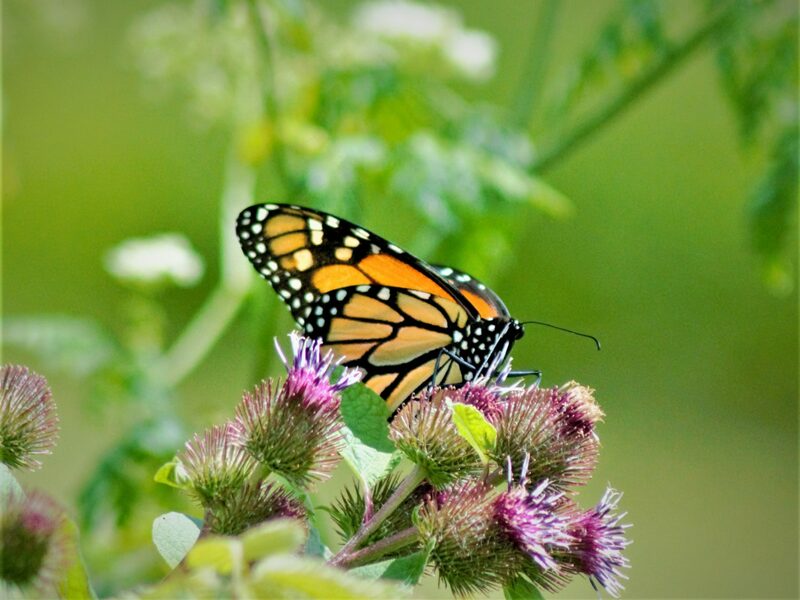 Watching a pair of monarch butterflies fly past an area that only a few hours before held a stand of flowering milkweed where they could have laid eggs, for example, calls into question some of the practices being used to maintain Beauty Spot Bald. On the other hand, without mowing down some of the dense blackberries and non-native bindweed, the entire area would no longer have any of the wildflowers and grasses these pollinators rely on. 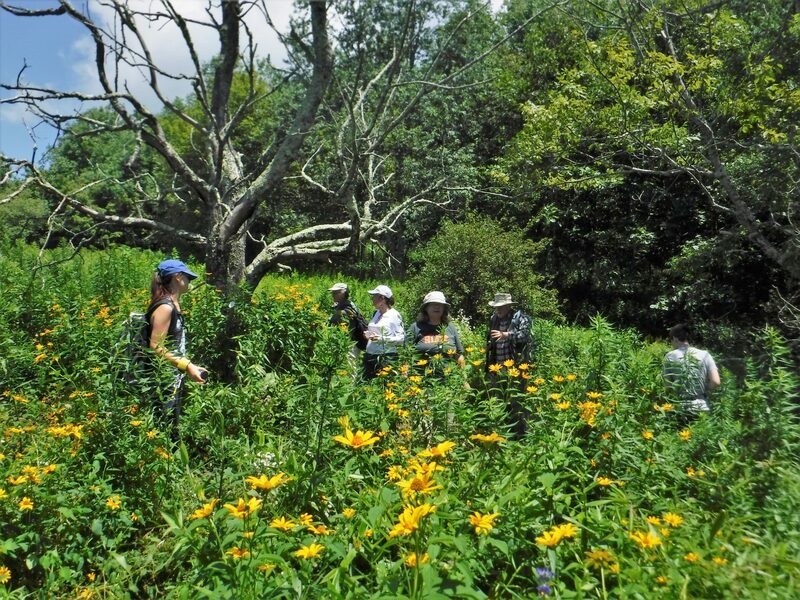 Research is ongoing throughout the region to figure out strategies that work, creating and maintaining habitat that is as pretty for us to look at as it is helpful for vulnerable species. Fortunately for all species involved, many of the flowers the butterflies and Bumble Bees love are easily adaptable to roadsides and changing environments. After surveying the areas left after the mowing, we moved from the parking space down the gravel road to the overlook. Along the way, we saw dense areas of wildflowers, including bright yellow Ox Eye Daisies, or False, Sunflower and even more Milkweed than in the more open habitat. Here the Bumble Bees were thriving, it was impossible to even glance toward a flower without spotting the signature yellow and black fuzz. We found more Common Eastern Bumble Bees, plus Confusing Bumble Bees and Bees in the subgenus Pyrobombus which cannot be visually identified down to a species level. While the day may not have unfolded the way we expected it to, it was still a great opportunity to enjoy our protected lands and think critically about their future.